The new Dover District Leisure Centre, and its home swimming team, Dover Life Guard Club, host their first major competitive swimming event this weekend with up to 300 swimmers representing 24 teams competing for honours at the Kent County Amateur Swimming Association (ASA) Relay Championships 2019 on Sunday, 17 March. The £26m Dover District Leisure Centre which opened on 25 February 2019 boasts a county standard 8-lane short course championships swimming pool which, along with seating for 250 people, makes it one of the premier competitive swimming venues in Kent. The 24 teams will compete over 28 events for all age groups, including heats and finals for the 4x50 free and medley relays for both males and females. 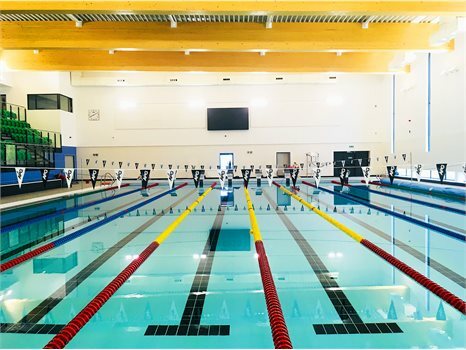 Roger Walton, DDC’s Strategic Director, said: "We’re delighted to be showcasing the fantastic competitive swimming facilities now available in Dover. We’re really looking forward to some first class swimming, and who knows, perhaps seeing some records broken!" Mike West, Development Manager and Vice-Chairman of Dover Life Guard Club, said: "It’s fantastic for us to be hosting such an important competition in our new home pool. We’d like to thank Tony Crafer and the Places Leisure team for going out of their way to help us achieve a smooth transition to the new leisure centre and in preparing for this weekend’s competition. "We’re looking forward to showing off the facilities to our fellow competitors. The pool certainly has fast water so we think it’s going to be a really exciting event!" The leisure centre is open to the public on Sunday although the swimming pool, teaching pool, sauna and steam room will be closed from 8.30am.